At Woodland Survival Crafts we are very proud of the standard of service we have provided over the years. It gives us great satisfaction to introduce people to the principles of bushcraft and help them to develop new skills. The feedback we get from our customers is overwhelmingly positive. Listed below are examples of the responses we get from those who have been on one of our courses. I wanted to write and say how much my daughter and I enjoyed the Family Bushcraft weekend. Dave the tutor was excellent. He kept things moving without pressure. None of the adults felt patronised – we all learnt a lot. None of the children felt out of their depth – they all had a great time. I will recommend the course to my friends. Thank you for a most enjoyable and enlightening weekend on wild food and wilderness cooking. I just wanted to say a huge thank you for your time and expertise over the last three days. I thoroughly enjoyed the whole course and feel much more confident about taking my learning forward which will, of course, have a very positive effect on my Forest School sessions. I’m well aware that I have a lot to learn and a lot of catching up to do, but the course has given me knowledge and skills to develop further. Enormous thanks for enlightening Alex and I on the inner secrets of fire making. I have now made fire everyday since… Fantastic! Thanks zillions, and see you in the near future. Just completed the father and son course last weekend with my son Ben. I wanted to take the time to thank and complement you all. The instructors, Ian and Paul, were magnificent. They created a warm friendly atmosphere and tempered it with heaps of knowledge and patience. We laughed, we worked and we bonded. It rained and we survived. What can I say! Lovely, lovely people. We will be back. Please accept my heartfelt thanks for a great three days on the Friction Firelighting course. It was immensely enjoyable and rewarding. I have had the pleasure of aquiring Dave Watson’s services and skills in woodland survival for my children at King’s School, Worcester for a number of years. He has a natural, easy style with children. His repertoire of shelter building, fire and string making, and giving them confidence to eat nettles and drink nettle tea are perfectly suited to children of all ages. He fires the imaginations of the children, many sleeping in the shelters, extending the positive effect he has had throughout the remainder of the camp and beyond. I look forward to his contributions with my annual camps and cannot recommend him highly enough. It was so good I wish I could come again and it was one of the greatest experiences of my life and thank you for showing me some of your outstanding skills in bushcraft. Thank you for a great day yesterday. As you could probably tell from my face I was chuffed to bits every time I got a coal! It’s amazing what a little one-to-one tuition does for your technique and confidence. I was practicing earlier this evening, as instructed, and got a lovely coal. Fantastic! Once again, thank you. Just wanted to thank you for an amazing course (Friction Fire Lighting) at the weekend. The tuition was great but your style and personality added to things immensely. Thank you very much for the weekend we spent with you. Both my dad and I really enjoyed it, and I think we both gained a lot from it. I will certainly never look at woodlands in the same way; I appreciate much more now the huge diversity of nature, and all the the ways you can work with it. I was amazed at how much your perception widens, even in just a few days, when living in the woods. At the end of the weekend when I looked around me I noticed new things and wondered what they could be used for or what they might mean. I also learnt lots of new skills which I will remember for life. The teaching team were excellent. You and the team have inspired me to spend more time outdoors. I have subscribed to the Bushcraft Magazine, and I hope to be practising bushcraft on my own and with my dad over the summer. Just a thank you for the family weekend. My son and I appreciated the time given and the skills taught over the 2 days. We look forward to seeing you all again on more courses. Once again many thanks. Overall Karen and I had a wonderful three days (Friction Fire Lighting Course) and were surprised at how much we fitted into each day. The tuition was perfect and we felt reached all the initial ability levels of those attending from complete novices to those like me who previously had so much smoke and so little fire. Tuition was keen and precisely tailored to each of us and I was most impressed with the amount of 1:1 tutoring you managed. Your staff were always approachable and with an appreciated sense of humour. I would not hesitate to recommend the course to anyone with the slightest interest in wilderness skills and bushcraft. Hi Dave.Thank you so much for your tutelage yesterday and in such a fabulous setting. I really wasn’t expecting to pop that hand drill ember, I didn’t think my hands would take it so that is a definite high point for me, especially as I forgot to take my wedding ring off on both attempts. Thanks for a great day – definitely the best away day any of the team had been on. I will highly recommend to our HPA colleagues and we will hopefully be coming back in the summer and this time we’ll stay overnight in the shelters. I know that delegates hugely appreciated the opportunity to meet you, so thank you for making the time to be there, and giving your support to the event...... Several people mentioned to me on the day that they found your session particularly interesting. We hope that you enjoyed the day and we look forward to seeing you at next year’s conference that will take place in Autumn 2019. I was lucky enough to receive a recommendation for Woodland Survival Crafts from a friend who had done a number of courses with Dave. I was looking to update my own personal skills and undertake a training course to help develop the bushcraft activity sessions I deliver through my activity business. 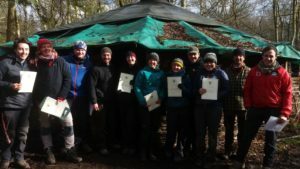 The Bushcraft for Practitioners course fit the bill perfectly and when it came round to the start I’d gotten another 5 of my staff on board too. The site was wonderful, a wealth of natural resources, beauty and isolation. Just enough home comforts to make the stay more appealing to the less experienced and wild enough to satisfy the seasoned wild-camper. The course content was as varied as it was in-depth. All the course topics were covered thoroughly and enjoyably, the level of practical activity was maintained very high throughout. The resources and reading materials made available to us were more than adequate. The highlights for most were the tree identification walk in the dark and, of course, the fact that every member of the course had lit fire with a bow drill by day 2. On a personal note, Dave has a patient and relaxed attitude and his passion for the outdoors was clearly visible in his teaching and the way he talked about the woods and his history. His level of skill and knowledge can only be described as expert and he was a pleasure to learn from. Dave was also ably assisted by Mike, Howard and Ewan, who, like Dave, were knowledgeable and great company. We were not the shyest of groups out there but they gave as good as they got! I would have no hesitation in recommending Woodland Survival Crafts to any individual or company. All 6 of us immensely enjoyed our time in Spring Wood and I for one have already started looking into other courses with Dave. I shall be buying the friend who made the initial recommendation a beer when I see him next. I am writing to let you know how delighted I am with both the service you offer for our young offenders and also the level of commitment from you in providing such a service… The level of service you provide is exceptional and worthy of note. Thanks for the course. My head is buzzing with all the new found ideas and skills. I’ve just been going through my photos and videos. I can’t believe the depth of material we covered. I can’t think of any other course I’ve been on, and I go on a lot, that has opened up such a wealth of opportunities. I can’t wait to get in to the woods to experiment and practice some more. Thanks, it was fantastic. Thank you for your time and patience on the recent Bushcraft for Practitioners 3-Day Course. I certainly gained much from both your knowledge, instruction and intuition along with the interaction of fellow instructors. Please pass on my thanks and appreciation to Howard. Thank you for a fantastic weekend and one I’ll not forget for a long time to come. The format of the weekend was excellent, spot on, without undue haste, but without being overly relaxed. This was more than complimented by the friendliness and knowledge of both you and Ian. It also lessened the anxiety having a friendly group of people willing to learn. Thank you again, I will be making a return visit for further study at some point. Many thanks again for such a superb course! It has really helped me see the woods in a whole new light and appreciate it from a different perspective! can not wait to get out again to really work on my skills! Thanks ever so much for an excellent weekend. I can’t believe how much I learnt and I’m sure I shall appear on one of your other courses. The weekend didn’t feel rushed, but we crammed so much in! Thanks again. Now that I’m back at work and the course is a week past, I wanted to drop you a line to say ‘thank you’ for an amazing, eye opening and high quality course. I learnt so much and re-evaluated what I thought I already knew, for the better. I’m also indebted to Howard and Nigel for their guidance and sage advice. The setting and company was delightful and the access to materials and equipment was more than generous. I’ve started to put my learnt knowledge to good use at school and would love to return for further courses. I’m practicing what I have learnt with a view to being assessed. Thank you again for a fabulous weekend of enjoyable learning! Thank you very much for doing last week - it enthused all the participants. Each of them came away with something and certainly for my staff, it will enhance the programmes we offer as well as providing them with personal skills. Just a quick note to thank you for a fantastic weekend! I have had great feedback from everyone on the course, about how much they enjoyed it and how they're looking forward to using these new found skills with groups. Thanks again for providing such a rich and rewarding experience! I thoroughly enjoyed my workshop with Dave, exploring den-making without using any string! It is so important for all Forest School Practitioners to refresh and update our skills, they are the resources we can draw on to support our work. And it is a useful reminder of what it means to be a participant rather than a facilitator. When you can do that alongside a diverse range of other practitioners, too, the learning takes place in so many dimensions. Thank you! I would like to thank you for a wonderful day of outdoor survival crafts last week. I have received comments of praise back from a number of people who attended and I wanted to pass these on to you. Thanks again. The children had a brilliant time. See you next year. An excellent week in a stunning location, the staff team really helped me to put the skills i have practiced and learned over a number of years into a first class bushcraft environment. I have found this course invaluable in terms of widening my knowledge, building skills and giving practical experience. It has made a vital contribution to my work as a Head of an Outdoor Centre and Forest School Leader Trainer. The pace of the course allows time to build knowledge and skills in a gradual and effective way. The site where the training takes place is a superb woodland environment. I particularly like the way that time was given to us as individuals to develop at our own pace and to our own requirements. This is definitely not an `Off the shelf` course. We are also encouraged to learn from other course students each with their own unique set of skills and experience. There was a great attention to detail especially in terms of preparation of materials and in skill development. There was also a great emphasis on learning by doing rather than relying from books. The element of 'Work experience' built into the course was also very useful. I usually work with children between the ages of 4 and 10 as well as adult Forest School Leaders. This course allowed me to extend my experience to working with family groups and adults interested in Bushcraft both professionally and personally. This is a superb course and I would highly recommend it to anyone who works in the outdoors, however it is also a brilliant course for adults who have a great desire to develop their own skills and experience for their personal use. My son Reece and I attended the Father and Son weekend during June 2009. Having never even slept outdoors before we weren’t sure what to expect. I have to say that it was one of the most inspiring, motivating and all round enjoyable experiences we have ever done. The course content was excellent and just enough for mere novices. The knowledge given to us by Dave and Howard was exceptional and has certainly made us view the woodland in a different light. This will hopefully give us the enthusiasm to do more in the future. In fact we are already considering attending the next stage course. Anybody thinking about doing Bushcraft but hesitantly should ‘go for it’. You won’t regret it. Thanks guys. Just a quick line to say thank you so much for the training day last week. Everyone has been buzzing about it. It was truly informative and inspiring. Thanks so much for coming such a long way and giving us such a good day. Building shelters was an amazing workshop where using simple techniques totally changed the outcome, thus facilitating confidence to put into practice what I learnt. Better than the Woodlore course I went on.